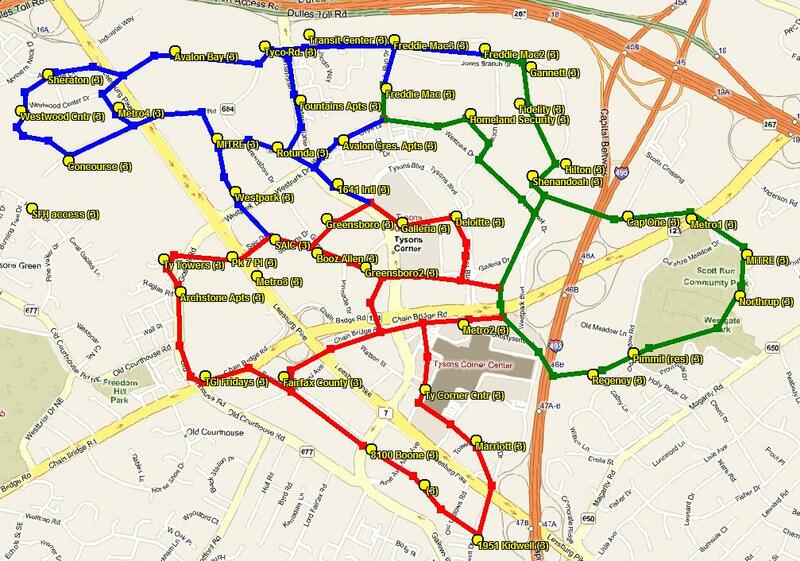 An option for the Tysons Circulator Plan. First version: Feb ’09. Current revision: May ’10. ULTra is a battery-driven, 200-mpg-equivalent, elevated personal rapid transit (PRT) system with many four-person vehicles. First deployment is scheduled for London Heathrow Airport in Summer 2010, to serve Heathrow’s new Terminal 5. Working as circulator transit for office parks, airports, universities, and other major activity centers, ULTra is faster than a car. In these applications, ULTra makes carpooling, Metro, and bus more effective, by solving the “last mile problem.” Each ULTra vehicle takes 30 cars off the road. PRT also enables longer bike commutes and shopping trips. A three-minute youtube video of ULTra can be viewed here. Peer-reviewed market research for two San Francisco Bay Area transit-served major job centers, Palo Alto’s Stanford Research Park (SRP) and Pleasanton’s Hacienda Business Park, forecasts a PRT-induced commuting mode reduction from more than 80% single occupancy vehicle (SOV) down to 45% SOV. In these two studies, carpooling increased to more than 30% and commuter rail transit increased beyond 15%. Such commuting shift shifts acres of parking for higher use. The Virginia Legislature’s January 2009 “Viability of PRT for Virginia” report concludes: “Interest and development of PRT appears to be growing around the world. With the inevitable construction of at least two systems and the testing underway of several others (although in most cases not at full scale), it can be argued that PRT is proving to be a feasible technology.” In California, three cities are pursuing PRT systems: San Jose, Santa Cruz, and Alameda. High resolution satellite imagery of the above sketch can be found at: http://www.ultraprt.net/cms/tysons2b.jpg (4000 x 2800, 3MB). “I can’t think of a more promising location for PRT in the region than Tyson’s Corner. Everyone agrees that its auto-based transportation network can’t support any more growth. I think the enthusiasm level for circulator buses is going to be low, and conversely you may be able to generate some enthusiasm for PRT as an alternative. The workforce in Tysons is fairly affluent; if you can save them significant time relative to a circulator bus (a pretty low hurdle given how congested Tysons is), they may be willing to spend some money and take some chances on PRT. There’s lots of private sector dollars in this area, which has more office space than downtown DC, so you may not have to depend on public funding. I believe PRT would complement, and make more feasible, a redevelopment plan to improve walkability in Tysons. As long as auto traffic volumes as high as they are, the landscape will continue to be dominated by parking and wide roads. Even in the short run, just putting PRT into the current development pattern would get a lot more people walking, since a majority of the buildings in Tysons will not have their own station. Get significant numbers of affluent people on foot and the political support for walkable redevelopment will grow.” – anonymous local expert. One of the advantages of a PRT network “is that it offers a lot of flexibility. It’s much less expensive than traditional transit. It doesn’t serve the same needs as high-speed rail or BART metro. It’s a complement to those systems,” Laura Stuchinksy, Sustainability Officer, City of San Jose Department of Transportation. “All the advantages of New Urbanism – its compact land saving density, its walkable mix of uses, and its integrated range of housing opportunities – would be supported and amplified by a circulation system that offers fundamentally different choices in mobility and access. Smart Growth and new Urbanism have begun the work of redefining America’s twenty-first century development paradigms. Now it is time to redefine the circulation armature that supports them. It is short sighted to think that significant changes in land-use and regional structure can be realized without fundamentally reordering our circulation system. We’ve been developing TOD without the T for far too long. PRT is the T.” – Peter Calthorpe. Circulator bus: 15 minutes. Makes multiple stops (a “milk run”). Circulators are usually a bit faster than streetcar. It’s 500’ as the crow flies from SAIC at 1710 Saic Drive to Panera Bread for lunch in the Pike Seven Shopping Center. People currently drive this, rather than walk. How does the circulator make this connection? It’s 800’ as the crow flies from BAE Systems, 8201 Greensboro Dr to the Tysons Galleria Legal Seafoods for lunch. People currently drive this, rather than walk. How does the circulator make this connection? These same questions arise for new residents in condos. How do they get to Starbucks without a car? A key consideration for the effectiveness of a circulator stems from “value-of-time.” A tech worker earning $100K per year and working 40 hours per week has a value-of-time while working of $50 per hour. During that worker’s commute, value of time is only $25/hour. The scarce lunch hour (now often 40 minutes or less) uniquely has the highest value-of-time, $100/hour. The measure of a transformative circulator is whether it will attract ridership during lunchtime. In the US, there are no suburban circulators that meet this test. (Some high ridership bus circulators can be found here: http://www.cities21.org/tdm2.htm#Shuttle). Tysons won’t transform without being effective for non-commute trips. 2. PRT enables increased walkability. Congress for New Urbanism co-founder Peter Calthorpe is a regional planning and transit-oriented-development expert. Calthorpe believes PRT is a transformative catalyst. Calthorpe is pro-pedestrian, pro-livability, and pro-PRT, and he sees the three being complementary. PRT provides a way to hop over the currently pedestrian-hostile Tysons arterial streets so that pedestrians can access the walkable zones. Over time, more and more zones will become walkable, but PRT can provide an immediate increase in pedestrians, by eliminating the need for a car. How pedestrian-hostile are Tysons arterials? Grandmothers with wheeled shopping carts literally risk their lives trying to make jay-walked, mid-street crossings on Leesburg Pike (with a teeny median providing scant protection when half-way across). PRT is the catalyst that allows the current walkable area within Tysons to expand over time.